Meditate with the Dragon Realm to harness the energies of the Full Seed Moon which took place in March 2015 in Libra at 1.05pm. This Full Moon coincided with the total Lunar Eclipse. That eclipse was about over throwing the old order, that can be within one’s self by realising old belief patterns or by standing up and speaking out rather than accepting the norm or that which has been. It was also a time to look within at what balance can be brought into your life and with the air element of Libra assisting in new creative ideas coming forth. 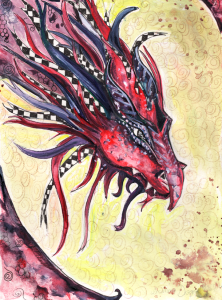 The Dragons are powerful wise beings who specialize in alchemy, abundance, transformation and creativity. In this workshop Alphedia will channel the Dragon Realm, assist you in opening up to Dragon Energy and aid you in a self-realisation exercise. You will be lead on a channelled Dragon meditation to receive soul wisdom and guidance. “Greeting from the Realms of the Dragon. We Dragons are honoured and privileged that so many are remembering us and connecting with us once again. We have waited a long time for humanity to turn full circle remembering our powerful alchemical wisdom and knowledge to aid you in your own soul journey as a race but also to assist Gaia, Mother Earth, your home which you all have a duty by your birth right to care for and we wish to assist you with this. This powerful Full Moon energy in Libra combined with the total Lunar Eclipse provides the opportunity for a balanced fresh start. An opportunity to let go further of the past. Be that your beliefs, your way of being or experiences you have had and start anew, manifesting who you wish to be. What you wish to create here on Earth and we Dragons wish to aid you with this. Particularly at this time many of you are feeling an excitement and some of you are feeling afraid. Afraid of the changes that are coming but we say to you do not worry. For staying in the heart centre and working on clearing your blocks within the heart are all you have to do. By being present in each moment and by remembering the oneness with all and how you are not separate you are aware you here as a part of a greater team of beings of light and we Dragons call to you now. Call to each one of you to remember us and through this healing journey we will provide for you at the Full Moon your connection to the Dragon Realm will deepen. We will be able through the Lunar Eclipse portal to come more fully into your lives.